Have you ever wanted to get faster data from CoinMarketCap other than it’s standard 24H change that gets updated every 5 minutes? Have you ever wondered what the consolidated RSI value of the coins are across all exchanges? With Cryptolume’s Table of Movement you can get this information. 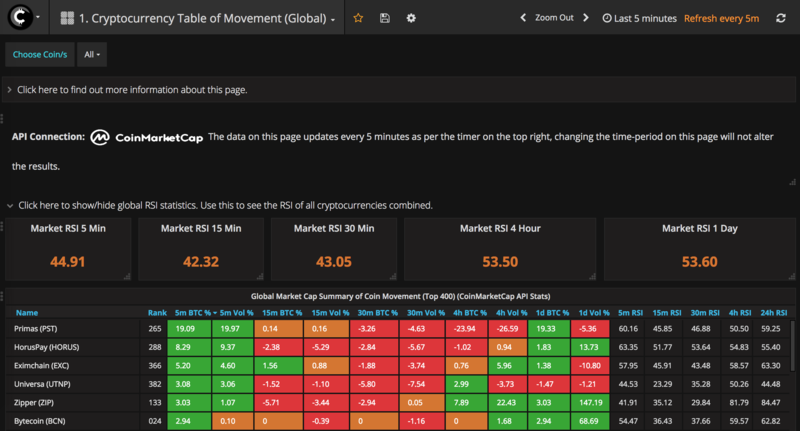 With Cryptolume, you can access 5, 15, 30 minute 4H and 1D changes through a table format (Much similar to CoinMarketCap) and we call this feature the Table of Movement. Not only do we provide this information, we also give you the RSI value of the price which is unique to CoinMarketCap. This means you get a consolidated RSI value across all the exchanges that are supported for that given cryptocurrency on the CMC website. We even took a step further and created market RSI (Relative Strength Index) values, which gives you the RSI value of all cryptocurrencies combined (Only top 400 supported to avoid volatility). See a global Market RSI value of all cryptocurrencies in the top 400 together. Great for understanding mass buyer/seller sentiment.